Welcome to the big leagues. I have a display case. Actually, my Wife was helping my Daughter clean out her room this past weekend and she decided she didn't want this in her room anymore. So it came to my office. Everything I have fits in it too. The top shelf has a collection of models from over the past couple years. The second and third shelves hold my entire Deathwing army. The troops on one and the tanks on the other. At the current rate, it should take me another decade or so to fill the bottom half of the case. Sometimes I turn on the light and just sit and look at my models. Dude, my little pony army builds are OP. Why don't you try playing an army that has to try to win. Geez. 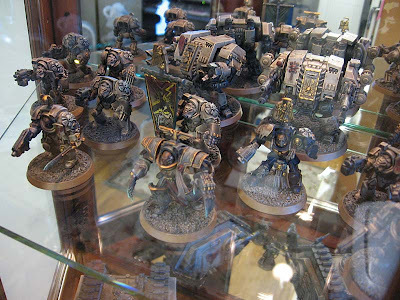 Michael Hogan: C'mon... the Rending Pony holds a dear spot in many Marine player hearts. You'll notice though, it's on the top shelf and not down with my army. I'll have you know, I don't have a single rending weapon in my Deathwing force. On a more serious note, it makes your models look seriously impressive! Then again, they were already amazing previously. Very nice Ron, had a similar cabinet for a while now, great to have around instead of having armies collecting dust or sitting in a case. Who's the guy with the 2 thunder hammers in the first pic? Any chance of a close up or 2? Michael Hogan: Thanks. It's the lighting, the models don't look that good in real life, trust me. Big Steve: He was a model I used for an Emperor's Champion a long time ago. Purely for show (as you couldn't have dual thunder hammers back then). I can see if I can dig up some pics of him somewhere. Flekkzo: It's tall, but only 18 inches wide and not even 10 inches deep. That's a "Rending Pony" in the background. It's the auto win model for Space Marine players. It comes from back when rending used to be much more deadly and players tried to get as many of those weapons in their armies as possible. A one trick "pony" army as it were. I have an Apocalypse data sheet for the guy. Hehe, make sure you invest in dusting supplies! Glass cases seem to attract dust like crazy! Looks awesome however! Totally cool! 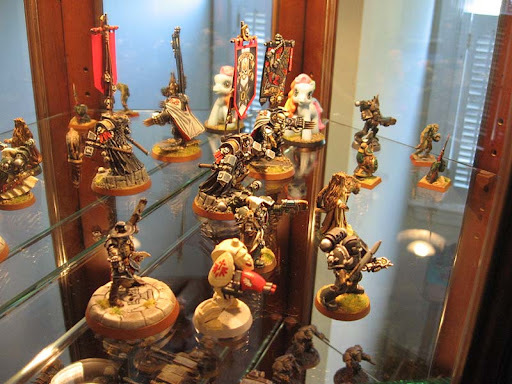 Display cases make the world of difference! Sylvos: My Wife wouldn't let put my guys inside until she cleaned it out. I'm only allowed to vacuum in the room, nothing else. I've been thinking about how it's probably a negative think that I spend so much more of my time looking at unpainted, partially painted models sitting on my desk than I do the painted models tucked away for transport. Being able to pop in and take in the scope of your accomplishments can only be a positive, encouraging thing. Man... I want a display case. I'm Jealous. Welcome to the club mate! Its makes a huge difference having the models stand out in the open on display, i am always very proud when i add another model to it. Sometimes i sneak in the living room where my display cabinet is and look at my painted models. My girlfriend then replies:" so where you looking at your models again...."
Looking mighty fine, I know from personal experience it just feels great to finish a mini and palce it together with the rest in the protective surroundings of your cabinet. Also nice to see a Gideon Lorr mini there! *Looks around office for a cabinet space* Hmmm maybe if I knock through to the bathroom? Jealous Ron, very jealous. Looks great. If ever anyone's work deserved a great display case like this, it's yours Ron. Looks outstanding! Thanks guys, but it's not the minis... there's just something about a display case that makes a mini look better.